I am short 100 shares of POT at $208.77. This trade is similar to the failed trade I made in HAL. Basically, I set a short-limit order to go short at $208 this morning. The idea is the stock is so extended that a strong open would likely pull back. 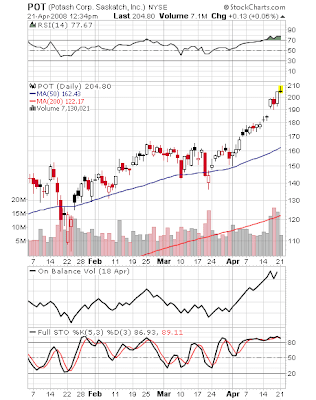 Considering the market is also overbought, I will likely keep this trade open for a few days. With these types of speculative trades that go against the trend, I use a tight stop and small position size. 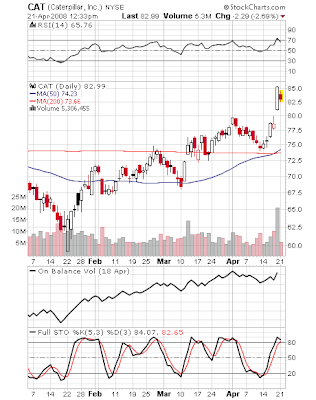 I am long 300 shares of CAT at $83.07. This is a classic breakout-pullback play. The stock could still pullback a little more, which is why I went with only 300 shares. I will likely buy 200 more if it pulls back to $81-82.